Morgan at The Brick House made this beautiful bench from some old fence posts and a pair table legs salvaged from worn vintage side tables. Utterly clever. Entirely recycled. Often the “before” shot is better than the “after,” but not here. Above is a nice use of nearly black paint on an old plaster wall in this Hemet, California midcentury cinderblock house. Via the blog The Brick House. Read the entertaining FAQ, in which the homeowners talk about buying nothing for more than $100 (except the house of course). 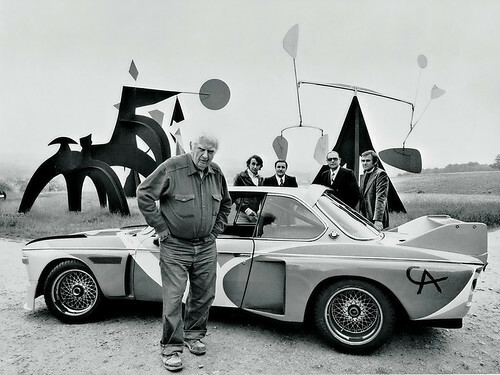 Calder with his self-designed BMW. His face too is a good design. Via the always interesting Wary Meyers, authors of the fun Wary Meyers’ Tossed & Found: Unconventional Design from Cast-offs. Does letterhead design reveal anything about the owner? Was Elvis himself responsible for that cool but unexpected minimal design (and if so, the terrible kerning of his name, too)? These are all from the blog Letterheady which collects letterhead stationery from an a wildly divergent group of people, organizations and eras.